If you have any questions or want to enquire about dates, use our form to contact Thomas & Cheryl Robinson or see their website for more information. Romaldkirk is one of those lovely villages where little has changed in 200 years. It sits peacefully in the north Pennines, lost to the world and without great need of it. As for the Rose & Crown, it dates to 1733 and stands on the village green next to a Saxon church. Roses ramble across stone walls at the front, so grab a pint of local ale, then sit in the sun and watch life pass by. Inside, you can roast away in front of a fire in the wonderfully old-school bar while reading the Teesdale Mercury. There’s a peaceful sitting room for afternoon tea, then a panelled restaurant for excellent food, perhaps local Raby Estate venison pie followed by white chocolate panna cotta and pistachio ice cream. Thomas and Cheryl bought the place in 2012 and have been spending money on it ever since: it has never looked better. Stylish rooms – some in the main house, others out back, a couple in a cottage next door – have warm colours, comfy beds, Bose sound systems and super bathrooms. Don’t miss High Force waterfall, the magnificent Bowes Museum or the sausage sandwich at lunch. Dogs are very welcome. Special offer: Stay in a superior room with breakfast, 3 course dinner daily and tea & scones on one afternoon - £95pppn based on two sharing for a 2 night minimum stay, April & May. 23-27 Dec and one week in January. Dog beds, towels for drying and locally made dog treats. Great walks from the door, village green next to the inn and river nearby. Lunch from £10.50. Dinner, 3 courses, from £27. Sunday lunch £19.50. Singles £95. 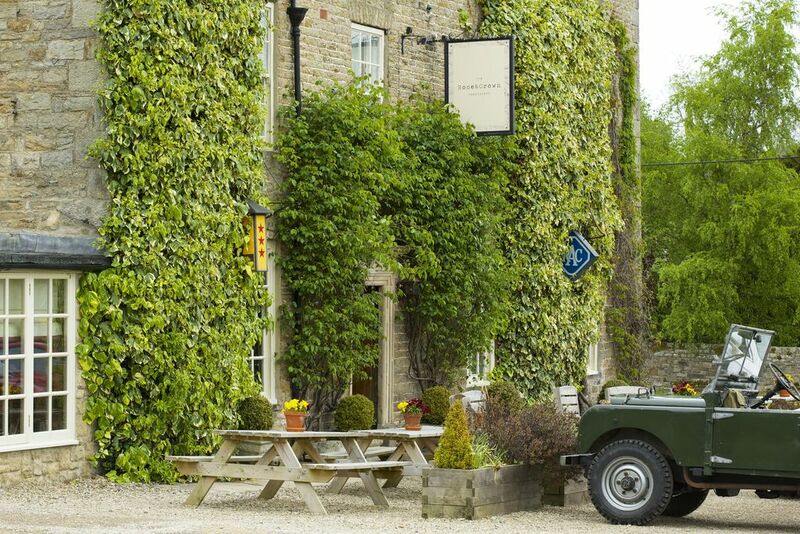 Dinner, B&B from £79 per person. Have stayed here on several occasions with my sister Daisy and my mum & dad, it is the most dog friendly hotel we have ever stayed in. We are allowed in the very comfortable bar where we sit under the table and eat the excellent treats provided by the owner, oh by the way my name is Gilbert and I am a nine year old westie. My dad, Kevin particularly likes the relaxed friendly atmosphere in the bar at lunch time. In the evening my mum, Marilyn likes nothing better than putting on a posh dress for fine dining in the romantic oak panelled dining room. We all love the R&C to bits. On a cool August day we received the warmest of welcomes at this beautiful and comfortable inn. It’s several years since we had enjoyed a stay here and we were once again charmed by beautiful rooms, delicious food and great service. We are planning another trip for this year. It’s an oasis of calm in a troubled world! Have stayed at the R&C many times. All of the rooms are furnished and decorated to a high standard. The housekeeping is excellent. All of the staff are kind, friendly and helpfull. The food served in both bar and restaurant is of faultless quality, good choices on bar and restaurant menus. The comfortable bar, overlooking the village green is a very relaxing place in which to enjoy good food and a drink. More formal dining in the oak panelled dining room is candle lit and romantic. Very dog friendly, lots of good walks locally. High Force - England's highest waterfall at 70 feet is a magnificent sight and on a beautiful stretch of the river Tees in upper Teesdale (8 miles). Bowes Museum - a magnificent 'chateauesque' museum housing collections of international significance of fine and decorative arts (6 miles). Eggleston Hall Gardens - delightful historical walled gardens that specialise in rare species and include a garden walk and shop (2 miles). Raby Castle - a superb example of a medieval castle in parkland filled with deer (9 miles). Barnard Castle - a charming market town with a ruined 12th century castle and famous for its antique shops on 'the bank' (6 miles). Hannah's Meadows - run by the Wildlife Trust these meadows once owned by Hannah Hauxwell are examples of rich unimproved upland hay meadows in a traditional farming landscape (3 miles).